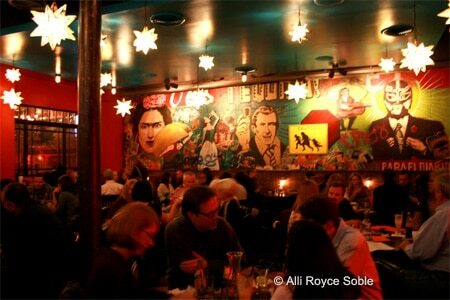 Mexican and Tex-Mex fare complemented by a long list of tequilas. : Bright colors evoking the Mexican aesthetic enliven the casual, comfortable space, which has a screened-in street-side patio. The restaurant is famous for its lengthy tequila list, which may be sampled in flights. We found the queso blanco and enchilada of short rib on our last visit lacking in zest, but the extensive menu has a lot to offer that might be more appealing. Tex-Mex selections include fajitas, and there's a wide variety of enchiladas and tacos, including those with smoked chicken, fried chicken, fried fish, chorizo, pork carnitas and mushroom. The side of grilled Mexican corn (elote) is fit to be the featured dish for a vegetarian. Also available are Mexican pizzas (grilled flatbread). End the meal with churros, fried apple pie or flan de coco. The small wine list has a few good choices, but beer is best with this food, especially a Mexican brew such as Dos Equis; a gluten-free Mexican beer is available, too. Kids get crayons to color their menus. Also located at International Terminal (Concourse F) and Concourse C of Hartsfield-Jackson Atlanta International Airport.